Since 2006 I, and other qualified members of P.M.C. 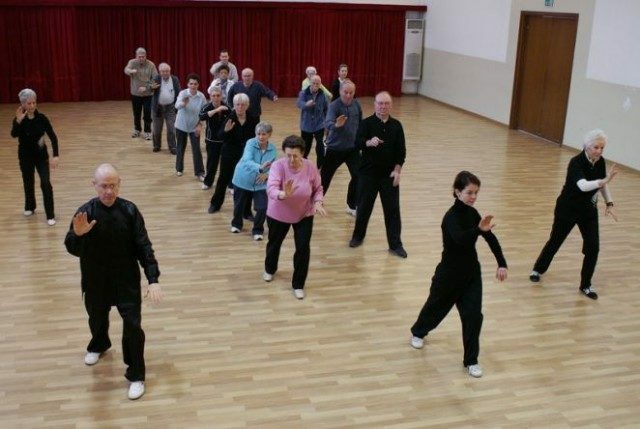 Association, founded by me more than 10 years ago, have been regularly running Tai Chi Chuan (TCC) classes dealing with tai chi benefits which has led me to work with Parkinson’s disease patients in Vicenza, Italy. Working with Nei Gong or Movement Awareness exercises, which are also adapted for those with ambulation problems, allowing them to work in a sitting position. The study of the basic footwork movements from the Yang Style Tai Chi, 24 Step Form and Qigong exercises. Increasingly we see evidence of scientific studies, which shows that regular Tai Chi training improves postural stability, walking ability, and falls reduction in patients with moderate Parkinson’s disease. Tai Chi Chuan is a very powerful instrument for everybody and particularly for those who suffer from neurological disorders, which result in movement problems. TCC training adopts a holistic approach, working with the physical, energetic and mental aspects. This work enables beneficial effects on the physical level by loosening the joints and strengthening the body, the energetic level by developing a greater internal vigour and on the mental level by increasing focus and awareness. The Traditional Chinese Medicine (TCM) approach to diseases like Parkinson’s considers that there are no “ill people” but rather individuals with a greater or lower freedom of movement, due to impediments of internal or external nature, which limit the practise of any discipline. Bearing this in mind, any discipline being prescribed, or practised, (in this case Tai Chi Chuan) has to be precisely defined and adapted to the student’s physical and social context. By applying a rigorous and scientific approach to the teaching and transmission of Tai Chi Chuan we develop a clearer position in which to to discern the degree of any interior lack of harmony. With this knowledge we can work, through appropriately tailored exercises to “adjust” the student’s way of being and get closer and closer to re-establishing an improved harmony in body movement and wellbeing. A basic principle in Tai Chi movement concerns the concept of roundness of movement. The basic exercises we prescribe have been created with a clear sense of the sphere, emphasising the presence of a central axis and the development around of the three dimensional layers in the space and related pairs of forces: up-down, front-back, right-left. The methodical application in each body part, when working with this principle, slowly builds up the process of awareness of the gesture. You move from the logic of the product, (how to make a gesture, or an exercise) to the logic of the process (how to perform the gesture and understand its correctness based on the principle of polarity). Through this work there is a re-education of body awareness, which helps to develop a greater awareness of one’s own being. This approach enables the student to leave the frustrating logic of not being able to command one’s own body when performing certain movements, (a typical experience for a Parkinson’s sufferer), and by the logic of this process, working slowly and sensitively taking small steps, to reach a correct result, parameterised to one’s possibilities of the moment. 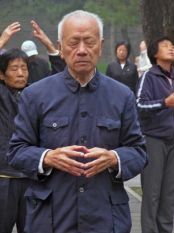 Creating this slow gesture, whilst being self-evaluated by working with a careful ‘listening attitude’, typical of that regularly applied during Tai Chi practice, makes it possible for the student to “map” of his/her own integrated system, that of the body-energy-mind, by applying the repetition of body movements, in conjunction with opposing powers in the three fundamental planes. Each class goes through all of the above-mentioned criteria whilst paying attention to two fundamental moments: movement awareness, and the application of the exercises in movement. This is achieved by using basic walking exercises as practised in Tai Chi classes. At the end of each group of classes (approx. once a month) simple exercises are also suggested to be performed individually without contraindications. During the lessons verbal reminders are made to stimulate the ‘listening’ quality to allow students to develop stronger body awareness, paying particular attention to their ability to have control over their bodies during the movements. It is less important for these students to remember particular movements drills, than getting a good sense of the basic principles at the heart of the fundamental movements of the human body. Regular, sensitive repetition is recommended as students should be encouraged to integrate them into their daily routine. Teaches Tai Chi Chuan professionally, practising Chen and Yang style, Tai Chi sword, Liu He Xin Yi Chuan, Qi Gong, Tuishou and Tuina. Following his scientific training, he deals particularly with teaching methodologies and with the relationship between Science and Holistic Disciplines. Besides Chinese Martial Arts, he teaches Mathematics and Statistics. He has been practising Tai Chi Chuan for more than 25 years and teaching it for 15 years in Italy and abroad. In his endless research he deepens his practice by attending regular seminars in China and abroad, studying with some of the most important Eastern and Western masters. He teaches “Didactics and Techniques of Tai Chi Chuan” in the master-level course of Preventive and Adapted Physical Activity at the Medicine Faculty of Padua University. He published many articles with specialized doctors of Recovery and Functional Re-education on medical journals. Since 2006 he has been teaching Tai Chi Chuan to Parkinson’s disease patients through a qualified approach both from a technical and a methodological-didactical point of view. He is the author of essays, articles and didactic videos. He is founder member and Secretary of WACIMA (Worldwide Association for Internal Martial Arts) and a member of the Executive Committee of the Taijiquan & Qigong Federation for Europe.